I spend most of my time on this blog talking about the little day-to-day things I do around here just to make sure we have food to eat and clean clothes, and that we don't step on sharp or squishy things on our way to the bathroom in the middle of the night. And, trust me, there's enough of that kind of chores to keep me plenty busy every day. But along the way, I am also in the process of tackling bigger projects while fixing up and decorating our apartment. Some things I save up to pay experts to do (like refinishing our wood floors - not that I think I couldn't do it myself, I'm just pretty sure I wouldn't want to), but others I research and tackle myself. Okay, and sometimes I make my mom help me when she thinks she's just coming for a fun visit, as is the case with the facelift we gave our entrance hall this fall (better than Heidi Montag's, I contend). There are a lot of wonderful details in our prewar walk-up apartment that make it feel special and distinct. Sadly, our entrance hall was not one of them. It was boring, bland and white, with (before I installed the chandelier) ugly recessed lighting, and a big, ugly electrical box that stuck out like a sore thumb. Once you made your way past the hallway, you were able to see the loveliness within, but, I was always a little disappointed in the dreary first impression the hallway gave. To liven it up, give the hall its own identity, and take advantage of the tall ceilings, I decided to add wainscoting on the lower part of the walls, and a bright, peppy wallpaper above it. After a lot of nail-biting, and navel-gazing, and hemming and hawing, and inner-contemplation, vacillation and dithering, I finally settled on a paper, with which I am unequivocally pleased. (The wallpaper is Favenay Cream from Pierre Deux. I painted the wainscoting Benjamin Moore Navajo White in Semi-Gloss to match the background of the paper). The results were better than I had imagined, and, as an added bonus, the vibrant pattern on the wallpaper works as virtual camouflage for the electrical box. Here are the simple steps to get this same look for your apartment or house - you will need some basic tools (even if you have to buy them, it will still cost way less than paying someone to do this for you) and carpentry skills (which you can learn by doing), and one free weekend (or, maybe less, if you are able to rope your mom into the project). Step 1: Remove any molding that is currently on the wall (I use a hammer and a flat-head screwdriver driven between the molding and the wall- it'll pop right off). Use your measuring tape and chalk to arrange the dimensions of the molding, until you are happy with it (Just remember that a 1x6 is actually only 5-1/2 inches wide, and a 1x8 is only 7 -1/4 inches wide). Step 2: Measure and cut a length of 1x6 exactly the length of your wall (remember- measure twice, cut once!) Use the stud finder to find the studs in the wall, and attach the piece of 1x6 to the wall using your drill and wood screws, driven into the stud at the top of where you want your wainscoting to be. Make sure it is level. Do the same with the side and bottom pieces. Make sure you sand the ends of your cuts so they meet up as smoothly as possible. Step 3: Cut a piece of chair rail the width of the wall, and attach it to the very top of the front of the 1x6 frame. Measure a piece of the floorboard, and do the same. Measure and cut the decorative molding to fit the interior of the 1x6 frame. Use the miter box to cut the ends at 45 degree angles, so the four pieces fit inside at right angles. Nail these in with finishing nails and use the nail sinker to sink the nails into the wood. Don't worry if everything doesn't line up perfect-perfect- that's what the Spackle is for. Use it now to fill in any gaps and all the nail holes- this is a good job for Mom. Paint all of the molding with a primer. Step 4: Be sure to paint the wainscoting completely before wallpapering the upper portion of the wall, so you don't have to worry about getting paint on it. I'll do another post about how to wallpaper, but this should keep you and your mom busy for a while. That has to be one of the most beautiful hallways I've ever seen!!!!!! Well done! I am very impressed!! On a side note - I love that chandelier! Do you have several of the same model? I think I have seen it before in previous posts about your apartment. It is very handsome! Would you mind sharing where you found it? Love it! You did an excellent job! This is very interesting information here. I wish I had found this first before I signed up for the other one. This is much better! Thanks for all the compliments, guys! Sometimes hard work is its own reward, but having a bunch of strangers tell you you're awesome is a better one. Anonymous: I got the chandelier on closeout from the Bombay Company before they went under a few years ago. I have heard they are planning to relaunch, but who knows if they'll ever make this same model again. If you promise not to make fun of me, the Pottery Barn Teen catalog (www.pbteen.com) has similar ones for cheap. Okay, fine, they have them whether you make fun of me or not. One more stranger saying the hallway looks terrific and its awesome that you did all the work yourself (with a little help from mom)! Hats off to you Americans! Wonderful project! My husband and I did a faux wainscotting in a previous house. We used only molding and not the 1 x 6 method you used. It was great, but (don't tell my hubby!) your treatment looks better. Great job. Thanks for sharing your well-written 'how to', as well. Oh my god!!!! I love it so much It made such a huge difference!!! and has inspired me to wall paper!!!! I'm thinking about Favenay Cream for my dining room, about 12 by 12 feet. It doesn't have high ceilings -- so no wainscoating -- but it does have a chair rail. What do you think? Too busy? Thanks for the Navajo White tip! Stephaniewebb, I used a circular saw (power) to cut the bigger pieces of wood, and a handsaw to cut the molding (for precision's sake). It took a little longer, but it was a good upper-arm workout. Anonymous, I love the Favenay Cream wallpaper and am thrilled with how it looks in my place. But it IS a busy pattern, and, depending on the size of your dining room, might make it feel kind of small (bold patterns usually do). I'd get a small sample and tack it up in the room. You'll get a sense for how it's going to look before you commit. Good advice about getting a wallpaper sample. It's a gorgeous look but could be too busy on all four of my dining room walls. A piece is on its way from Pierre Deux. We'll see. Thanks Lily! BEAUTIFUL! I'm always scared of wallpaper, but you have inspired me. Now I might have to go wallpaper a room in my house and wainscoat it! Great work. I found you through Design*Sponge because of this post. OMG. Fabulous! I am now an avid FOLLOWER!!!!! Hi, I found your site on Design Sponge. 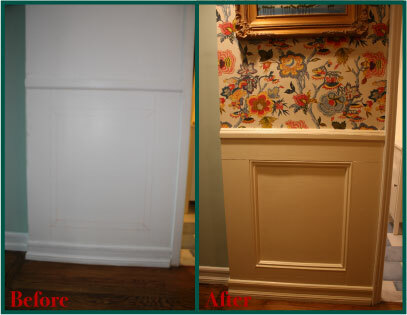 This is a wonderful makeover, I'm so impressed with your wainscoting! 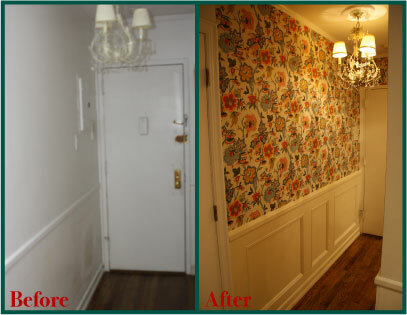 I did faux paneling in a couple rooms of our house with picture molding, it makes such a difference.